Join us as we check out the Tiny Truths Illustrated Bible by Joanna Rivard and Tim Penner. We were given a copy to read and review by the publisher and my kids have come to love this book and look forward to reading it each night before bed. This little Bible story book includes 15 Old Testament stories and 18 New Testament stories. They are pretty comprehensive and each story is about four pages long. Some are quicker reads than others. We like how easy the stories are to read. My daughter who is in second grade can easily read the stories to her little brothers. The stories are all told in a way that holds the kids’ attention – even the teenager thinks they are funny sometimes. Our favorite part of this Bible story book are the illustrations! They are all adorable, colorful and age appropriate. Some of them are downright hilarious – like this one of a mouse trying to take a donut from Jesus while He eats at Zacchaeus’ house! On the next page the mouse is happily munching on his treat. The kids have enjoyed looking for these little bits of humor in each story’s illustrations. I also like how the characters are ethnically accurate. There is a great attention to detail in each illustration from the settings to the emotion of the characters. I also like how each character is easy to spot if they show up in another story later – Jesus always has on a white tunic with a red sash, etc. 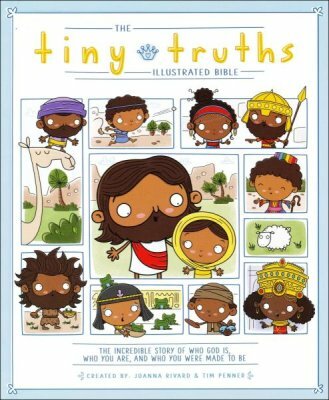 If you are interested in the Tiny Truths Illustrated Bible hop on over to Amazon and check it out! They have a Kindle version as well as this hardbachttps://amzn.to/2OyQD9uk version. You can also enter for a chance to win your own copy provided by the publisher over at the Blessed Freebies website.